shreddedmulch.com-admin | Rubber Safe Playgrounds Inc.
Do you want to help the environment and make your playground safer? You can do it by using rubber mulch over regular mulch, sand, or any of the other options that are out there when building a playground. Here is why rubber mulch is such an eco-friendly playground material to use for your school, park, or facility. Fact: Rubber mulch is made from recycled tires and rubber. Just about all rubber mulch is created by taking old tires and other rubber products and recycling them. If these items weren’t turned into rubber mulch, they would likely end up in landfills and other waste facilities where they would do harm to the environment. But when they’re turned into rubber mulch, they become an invaluable tool for those who build playgrounds. Fact: It won’t need to be replaced for years to come. Once you install rubber mulch in a playground, you won’t have to worry about replacing it anytime soon. Regular mulch will usually need to be replaced every couple years once it starts rotting. It can also blow away in the wind, float away during a downpour, and even sink deep down into the ground. None of these things will happen with rubber mulch, which is why replacing it won’t even have to enter your mind. It will last for many years to come. Fact: It hasn’t been shown to do any damage to nearby plants, grass, or flowers. Some people used to think rubber mulch might harm plants, grass, flowers, and other forms of wildlife. But rubber mulch has proven to be 100 percent safe for all of these things. When you install it properly, it will have no effect on nature. 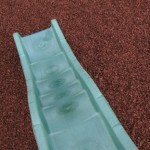 There are many other benefits to using rubber mulch for your playground. Rubber Safe Playgrounds Inc. can help you install rubber mulch and tell you more about why it would work so well for your playground space. Call us at 630-330-6589 today to hear why you should use it.